Our attorney-crafted Last Will & Testament declares what you want to happen with your assets and other matters upon your death. A Last Will and Testament is often called simply a “Last Will.” It is a document delineating your wishes for how your property and affairs are to be handled after you pass away. It tells the court in a probate hearing – the legal process that validates a Last Will or distributes assets after a person dies – what to do with your property and other affairs. This includes not only who gets your valuables, but also how to address your debts and expenses, as well as any charitable contributions or other bequests. While you are considering making a this document, you should think about making a Living Will as well. If you’re unsure about how these two documents differ, read about the differences between a Living Will and a Last Will and Testament to ensure you have a clear understanding. Each minute of the day, online users share roughly 2.5 million pieces of content on Facebook, Tweet 2.8 million times, post 2.2 million photos on Instagram, and swipe over 400,000 times on Tinder. As such, you may feel compelled to appoint a digital executor to manage your digital estate. The executor is the person you designate to settle your affairs and ensure the stipulations in your Last Will are carried out. You should also designate a backup executor in case your appointed person pre-deceases you or is otherwise unable to serve. The executor can be paid a fee as you see fit. The compensation can be a percentage of your total estate, a flat fee, or an hourly fee. An executor bond protects heirs from any possible mismanagement or fraud, and helps ensure that the executor follows the wishes in your Last Will or the state intestacy law. A guardian takes responsibility for any dependent minors or elders if you and your spouse are deceased or unable. You can further appoint a pet caretaker and set aside money for the care of the animal. It is important that you designate a guardian for your children in the event you and your spouse both pass on. While The Girl with the Dragon Tattoo is an extreme example, responsibility dictates your children are never put in the position of having an unknown judge determine their future. Your assets are your money and property. They can be either real assets, e.g., tangible personal property, land, houses, etc., or digital assets, e.g., online accounts including social media accounts, domain names, etc., or money in various online accounts. Your Last Will should identify all of your assets and what is to be done with them. Beneficiaries are the people or organizations who are to receive your assets. These can obviously be family and friends, but oftentimes can be individuals or organizations you’re indebted to, charitable organizations, or other institutions you wish to bequest with your valuable assets, e.g., a university or church. Keep in mind that before your assets are distributed to beneficiaries, debtors collect what is owed. The remainder is your residuary estate. In other words, it’s anything left in your estate after all debts have been paid. Remember that only assets owned solely by you at the time of your death are included in your estate. For example, a joint bank account in the name of you and your spouse will not be part of your estate, as it becomes the property of the other owner (e.g., your spouse). This can apply to homes, automobiles, land, life insurance, or any asset that includes more than one owner on the title or designates in the title who any beneficiaries will be. By making a Last Will form, you ensure that your funeral wishes are fulfilled. As such, you should plan for your funeral, including how and where it is to be conducted, and allocate money for it. Also, if you accrue significant medical expenses in the days before your death, you can put aside funds to cover those expenses. This AARP article highlights odd funeral requests and stories, including one prankster who mailed handwritten cards to his friends two months after his death with heaven as the return address. Everyone should strongly consider having a Last Will as part of their estate plan to take care of property and other assets owned at the time of their death. According to the American Bar Association, you do not have to use a lawyer to write one. Instead, it is legally valid if it meets your state’s legal requirements. If, however, you have extensive wealth or complicated concerns, a lawyer can help you navigate the legal or tax implications of your bequests and preferences. The most common distribution scheme is to leave all of the assets owned at the death of the testator to the surviving spouse. If the spouse passes away first, then all of the assets would instead go to the children equally. The distribution to the children would be “per stirpes”, meaning that the assets in the estate are divided into equal shares among each branch of the family. In other words, there are as many shares as there are people on that family level. For example, if the testator has two children and no surviving spouse, his or her estate would be divided in half, with one half going to each child. If one of the children has already died, but leaves behind three children (grandchildren of the testator), then that deceased child’s half is further divided into three parts, with one part going to each of the deceased’s child children (i.e. testator’s grandchildren). In this way, you can prepare a document that takes into account various contingencies in the future and not have to update your will. Of course, the testator can also allocate different percentages to different family members, or allocate any portion of his assets to a specific person or entity, leaving the balance for distribution to his family. 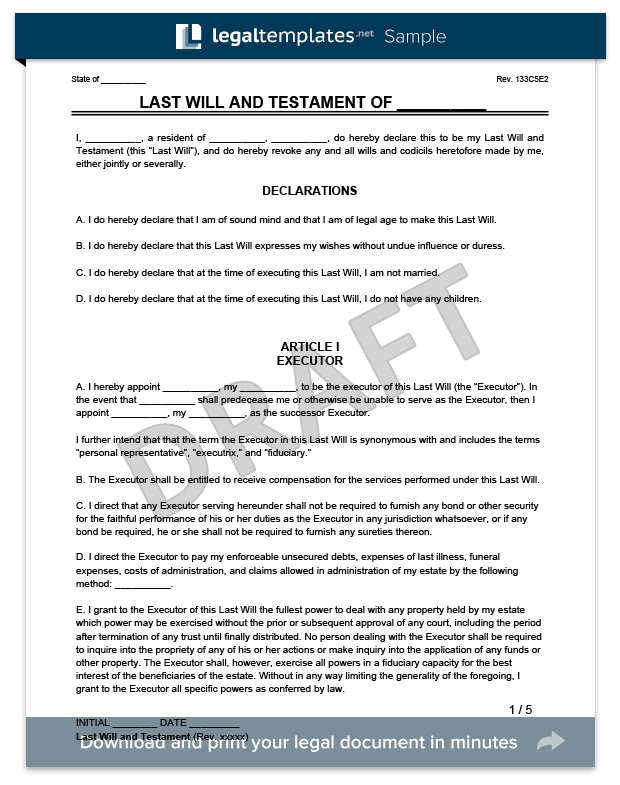 Our free Last Will and Testament template helps you to designate your executor, name beneficiaries, and ensure that your instructions for your assets and posthumous concerns are followed, with the weight of law behind them. Be sure to be as detailed as possible, including conditions for property bequests, exact monetary amounts, and descriptions of art, jewelry, or other valuable assets you are leaving to loved ones or various organizations. A Last Will & Testament, better known as simply a Last Will, is a written document setting out what you want to happen with your assets and other matters upon your death. A Last Will tells the Court in the legal proceeding normally referred to as probate, what you want done with your property. But distributing your property to those you desire is only part of the purpose of the Will. The Will also can set out how you want your debts, funeral, and hospital bills paid. You can also specify where you would like to be buried or make any other specific requests or make known any other desires, such as charitable contributions and other specific bequests. Although there are certain standard forms and routine language used in Wills, there is no mandatory language that must be used. The primary issue is that the Will be clear and concise and state exactly what your wishes are so that the Court will be able to properly construe your intentions. In this regard, sometimes simple is the best. The testator is the adult making the Will and stating their preferences on how property should be distributed to their family, friends, and charitable organizations. The will or testament becomes effective at the time of the testator’s death. The state in which the person who is creating the last will resides is also the governing state (whose laws will apply to the legal document). How does having a spouse or children affect my last will? Your Will allows you to determine who gets your property. If you are married or have children, you would normally want your property to go to your spouse and your children. However, you may have certain property that you want to be distributed to a special person or friend who you know may want that certain item or collectable of yours. This would be the way to make sure that your property goes to the people that you want. If you do not use a Last Will, then you have no control over who gets your property. All states will have laws determining how property of a deceased person are to be distributed in the absence of a Last Will. Typically this will mean that your surviving spouse will inherit your property with a portion of your property going equally to your children. Without surviving spouse or children, the property would usually go to parents or siblings. Who are the beneficiaries for personal property? Beneficiaries are who you want to receive your property. Beneficiaries can be your spouse, children, relatives, or friends. Personal property includes jewelry, clothing, furniture, books, pictures, paintings, collections, art, or vehicles. Personal property does NOT include cash. Who are the beneficiaries for the remaining estate? How should I distribute my remaining estate? Anything left in your estate after all debts have been paid should be distributed according to your preferred priority. You can specify more than one person to receive a portion of your remaining estate. What if one of my beneficiaries passes away before I do? If you are leaving your property to someone and they happen to pass away right after you, your property would now become theirs and go to whomever their Will dictates. Instead, if you had known that the person would have died shortly after you passed away, you would have wanted your property to go to someone else instead. Who is the Pet Caretaker? If you have certain animals who will need to be taken care of after you pass, you should name responsible caretakers and can even designate certain funds to be used so that it does not become a financial burden on your friend or the person you appointed for your will.